Djibouti Ambassador Aden H. Abdillahi welcomed Turkey’s increased attention on Africa and its recent initiatives. 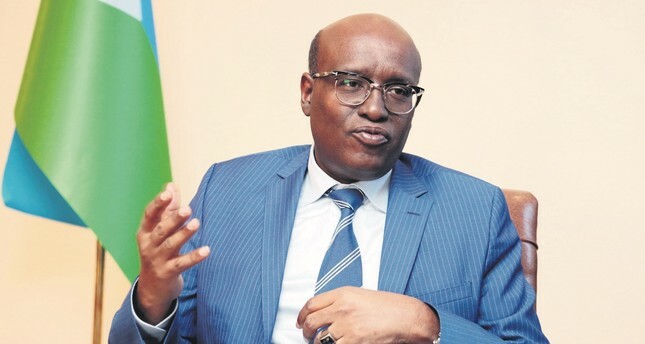 Djibouti is open to any kind of approach from Turkey such as building a military base to secure the Red Sea, Djiboutian ambassador to Ankara Aden H. Abdillahi has said, pointing to possible steps that could be taken to strengthen military ties between the two countries. Citing the Red Sea as the second-busiest sea way in the world, Abdillahi said: "This international sea way must be secured and the international community needs to ensure that this area is safe from all kinds of threats." In line with efforts to enhance the security of the region, the ambassador said that "possible steps from Turkey to build a military base in the country would be welcomed." Djibouti has become home to key military bases due to its strategic location on the Horn of Africa. The small country on the Red Sea hosts the largest permanent U.S. military base in Africa as well as military bases of France and China and Japan's only foreign base. The country lies on the Bab el-Mandeb Strait, which is one of the busiest shipping routes. Djiboutian Ambassador Aden H. Abdillahi with Daily Sabah's Özgenur Sevinç (R). Commenting on the recent graduation of Somali troops from the Turkish military base, the ambassador said that as a neighbor of the country, "Djibouti feels gratitude for Turkey for providing help to the government of Somalia." He added that Somalia should be supported in its fight against threats of terrorism that affect the daily lives of the people, pointing to the recent terrorist attack in the Somali capital of Mogadishu. He said the bilateral ties between the two countries have enhanced since the opening of a diplomatic mission in Djibouti in 2012, and that friendly relations between Turkey and Djibouti go back to the 16th century. Abdillahi also welcomed Turkey's increased attention on Africa and its recent initiatives. "Turkey already started opening up to Africa in 2005, and in 2008, we had a Turkey-Africa summit. I think this new approach will boost ties further." Touching on the visit of Djiboutian President Ismaïl Omar Guelleh to Turkey, Abdillahi said: "Omer Guelleh's visit to Turkey will completely change the relationship between the two countries." He said that the visit will pave the way for further cooperation in various fields, including education, health and economy. The two countries signed many agreements while he was in Turkey. In relation to the economic relations between the countries, the ambassador said that Turkey and Djibouti agreed on establishing a Turkish special economic zone that will enable Turkish business to establish industries. "The business community can reach out to the region having a special economic zone with many facilities that will also allow Turkish business to target the whole region," he said. He added that the port facilities in Djibouti rank among the best in Africa and that the economic zone provided to Turkey is close to the port. Pointing out that Djibouti is the entry point of the region, he said many investments have been made in the port facilities, railways and highways to connect the whole region. "In East Africa, the potential that we have is huge, and Turkey has great potential, as well. Building a strong partnership will benefit both sides. Today, this area is booming," he said. In relation to the U.S's decision to recognize Jerusalem as the capital of Israel and relocate its embassy from Tel Aviv to Jerusalem, Abdillahi said: "We need to thank Turkey for its leadership for emphasizing that the decision cannot be accepted." Turkey condemned the decision from U.S. President Donald Trump, and Erdoğan urged world leaders to oppose the decision in an Organisation of Islamic Cooperation (OIC) summit in Istanbul. The OIC announced that it recognizes east Jerusalem as the capital of Palestine. The U.S. decision was rejected in the United Nations General Assembly, which has isolated the country. "We need to express our solidarity with the people of Palestine who have been suffering, and accept the two-state solution," Abdillahi said. He added that the decision to reject the U.S.'s steps was a wakeup call and Turkey's decision to open an embassy in east Jerusalem would be a game changer.